Debbie Stevenson, pictured on the right. My name is Debbie Stevenson and I am a 8 year Breast Cancer Survivor. On January 28, 2010 I received a phone call from my doctor that I had breast cancer. Right after I was diagnosed my husband said ‘lets go to the mall’. When we got to the Mall he took me to the Susan G. Komen office at Ridgmar Mall. When I walked in the door I met Jennifer, a survivor. Jennifer and other Komen staff members told me I was not alone. In February 2010 I had surgery followed by 6 weeks of radiation. I have taken a pill every day for more than 7 years to help prevent a re-occurrence. It is an aromatase inhibitor, a hormone therapy drug that can slow or stop the growth of hormone receptor-positive tumors. Susan G. Komen research funds developed this drug. I support Komen so they can continue to help me and other survivors win our battle. I have worked on the Race Committee for 6 years, to help make the survivor tent special for all of the survivors. I volunteer to register people and give out T-Shirt packets for the Race. I am the President of Bosom Buddies oxe, a group of survivors who meet once a month to help support breast cancer awareness. On Race day, I am part of a team of survivors that stand together to say we are strong, come join us in the fight to end breast cancer. 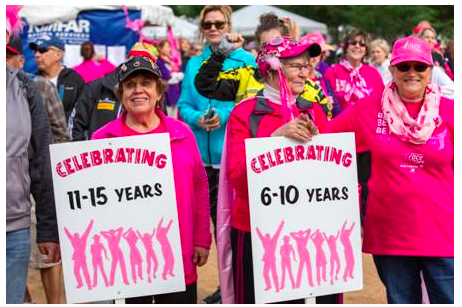 As a Survivor of breast cancer I do not know what my life would have been like if I had not found the support of the Susan G. Komen organization. Cancer is a life-changing disease that takes a tremendous physical and emotional toll on the patients and all of their loved ones. I have a wonderful team of doctors and nurses that have supported me and my family with knowledge, love and care. Please remember…1 in 8 women will be diagnosed with breast cancer. If you are one, reach out for support, you will never be alone. We are fortunate to have Debbie on the Susan G. Komen Greater Fort Worth team of supporters!